Last edited by Pardner on Sat Jun 26, 2010 2:14 am, edited 21 times in total. The purpose of this tutorial is to configure GTK Radiant 1.4 to work with the stand-alone release of Smokin-Guns. I have Smokin' Guns installed to "C:/Program Files/" and I have written all my paths as such. If you have installed Smokin' Guns to a different directory, read this tutorial carefully and change the paths to match yours. 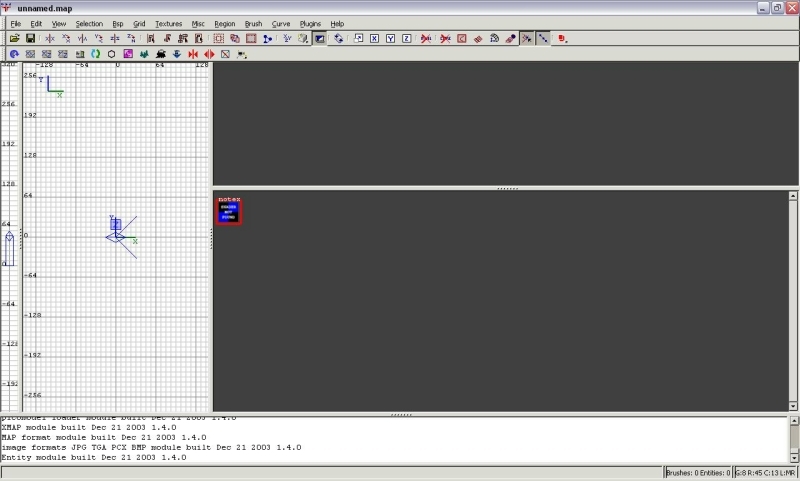 This is the actual level editor. Do not use the compiler that comes in it installation!! Includes two test maps "dm_test1.map" and "br_test1.map" Please compile these before attempting to make/compile your own map. 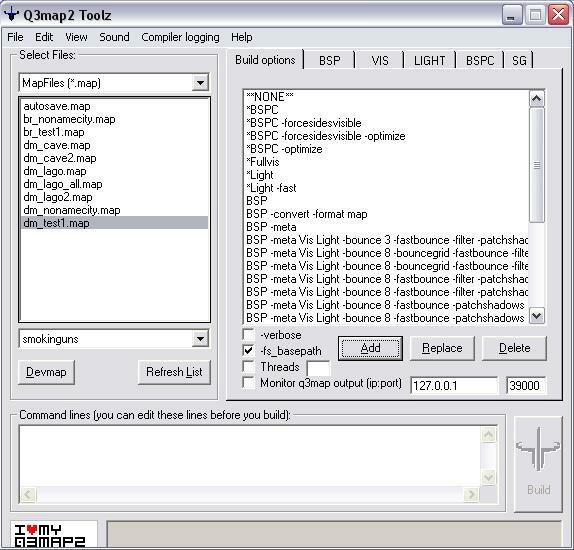 This is a GUI front end to the q3map2.exe compilier. This is not necessary program. You can also use windows batch files. Used to call the compiler and compile your maps. 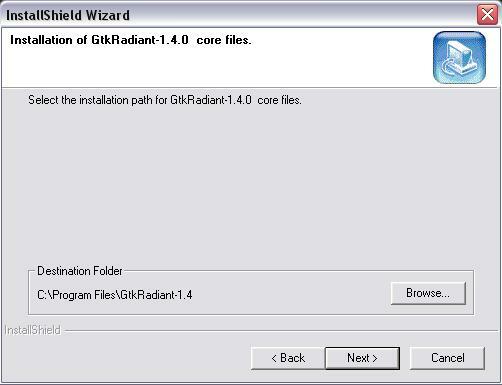 Installing GTK Radiant 1.4 is pretty straight forward, but we are going to be making some changes along the way. 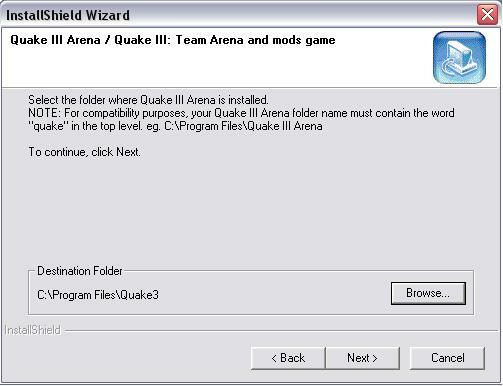 Since Quake III Arena is no longer used by SG, we will be installing the mapping tools into the Smokin' Guns directory. 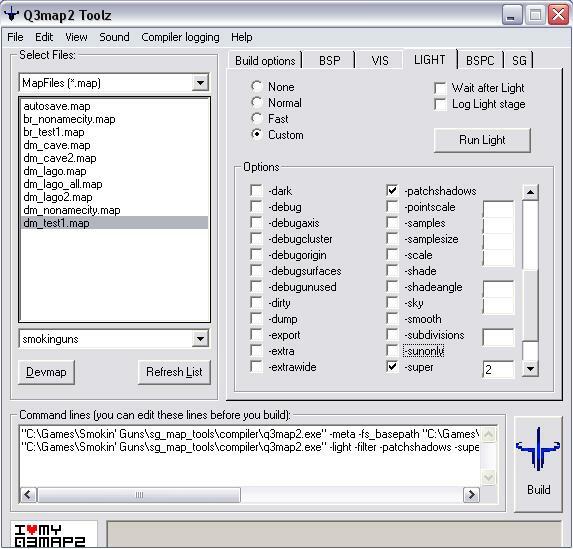 If you plan on using Q3Map2Toolz, which is a front end GUI for compiling, you will need to install it now before continuing with this tutorial. Run the installation executable; where it is installed is not important, therefore "C:\Program Files\Q3Map2Toolz" is fine. Extract sg_mapping_toolz.zip to your desktop. 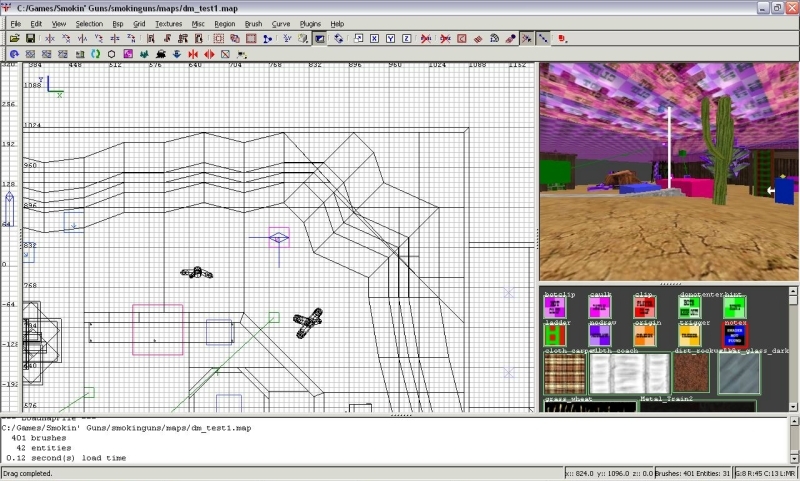 Open the newly extracted sg_mapping_toolz folder. Copy or move the GtkRadiant-1.4 folder to "C:\Program Files\" and select YES if asked to overwrite. **NOTE**: If your path differs from C:\Program Files then you'll have to open "*/GtkRadiant-1.4/games/sg.game" with a text editor (like Notepad or Wordpad) and fix the paths to your directory. Don't forget to SAVE in your text editor. 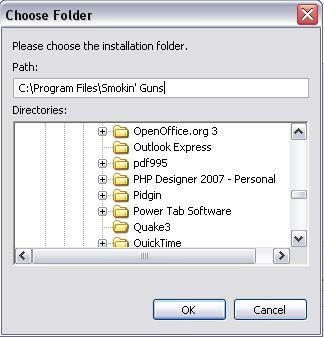 Copy or move the smokinguns folder to "C:\Program Files\Smokin' Guns" and select YES if asked to overwrite. 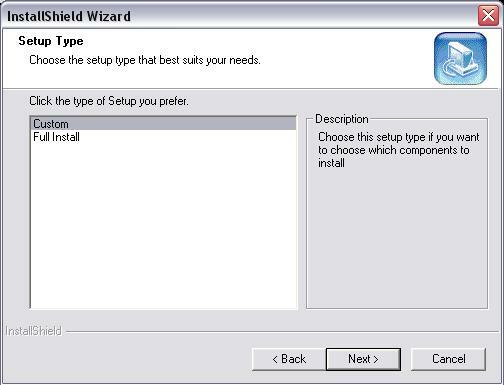 Copy or move the Q3Map2 Toolz folder to "C:\Program Files\" and select YES if asked to overwrite. GTK Radiant 1.4 should now be working with the Smokin' Guns stand-alone. 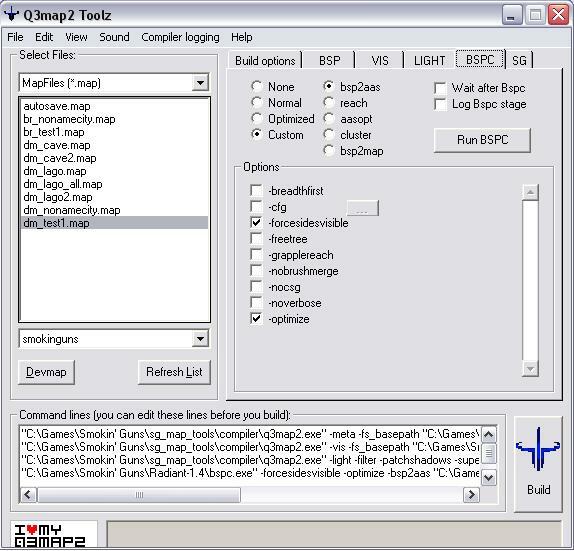 If you follow this tutorial you should be able to map for Smokin' Guns without installing Quake3. Last edited by Pardner on Thu Dec 10, 2009 6:04 pm, edited 12 times in total. The purpose of this tutorial is to guide a user through the process of editing and compiling your first Smokin' Guns map. 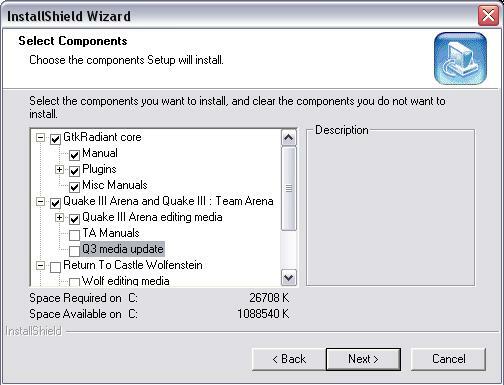 For this tutorial, I am assuming that the user followed the above tutorial to install GTK Radiant 1.4, Q3Map2Toolz, and the sg_map_tools package. For this tutorial, I will be compiling dm_test1.map and br_test1.map. There are plenty of options that do different things, but this is a good starting point for the light stage. Click back to the "Build options" and click "Build" and you should see a DOS prompt window open and start to build your maps. 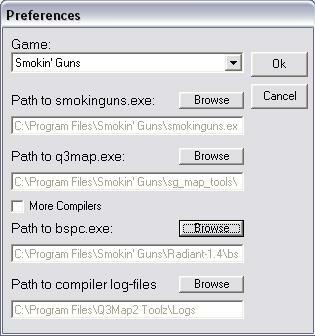 When the compiler is finished, click "Devmap" and Smokin' Guns will launch and you will be able to play your new map. If you want to compile both the death match map and the bank robbery map at the same time, just select both in the menu to the left. 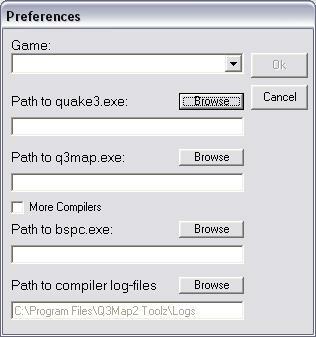 Using a batch file accomplishes the same thing as Q3MapToolz does except it does not have a GUI to help you. You must include the compile switches manually. What is the advantage of using batch files? (1)It takes one click to compile maps. (2)You can compile multiple maps at the same time. 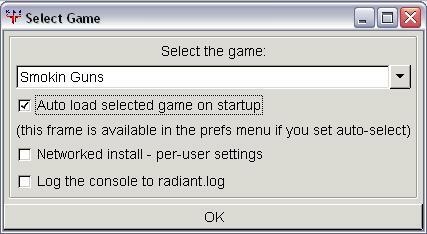 (3)You can have it do system commands after the compile (such as launch smokinguns.exe or shutdown the computer). To create a new batch file, open wordpad and save-as a ".bat" You should be able to run the batch file simple by clicking it (or double clicking it). "smokinguns\compiler\q3map2.exe" -meta -fs_basepath "C:\Program Files\Smokin' Guns" "smokinguns\maps\dm_test1.map"
"smokinguns\compiler\q3map2.exe" -vis -fs_basepath "C:\Program Files\Smokin' Guns" "smokinguns\maps\dm_test1.bsp"
"smokinguns\compiler\q3map2.exe" -light -patchshadows -super 2 -fs_basepath "C:\Program Files\Smokin' Guns""smokinguns\maps\dm_test1.bsp"
"Radiant-1.4\bspc.exe" -forcesidesvisible -optimize -bsp2aas "smokinguns\maps\dm_test1.bsp"
You should be able to edit and compile your maps now! GTK Radiant 1.4 takes some getting used to, but you should have all the proper tools to get you started the right way. If you need help with using GTK, you should take a look through these great web pages. 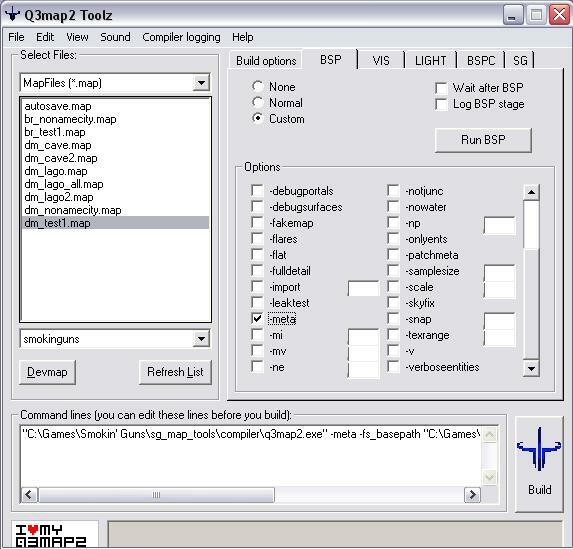 Q3Map2Toolz adds a nice interface to the q3map2.exe compiler and can accomplish everything that can be done in a batch file. Batch files create a simple way to compile maps quickly. Different mappers have different preferences, and of course every mapper compiles differently.